Practice slow scales every day, quarter note equals 50, two beats per note. When you breathe, repeat the note that you breathed during. Listen for the ultimate clean connection from note to note. "The remarkable clarity of Alessi's trombone brought bravos from the house." "Joseph Alessi's performance in the first movement is unsurpassed on records"
"Joseph Alessi, the Philharmonic's principal player, was absolutely splendid"
"Some of the best trombone playing I have ever heard"
"His technique and powers of musical expression were flawless"
"a stunningly virtuosic performance by Joseph Alessi." "The purity and excitement of Alessi's playing are breathtaking"
"The incredible Alessi had it all"
"Alessi displayed impeccable technique and exquisite phrasing"
"...burnished tone, concentration, and virtuosity..."
"One of the best trombone recordings ever made..superb tone quality at all dynamic registers "
"...the Essential Purchase of 97, Alessi has the edge..."
"Joseph Alessi tackles the virtuoso solo part marvellously. His sonority and projection in all registers, crystal clear articulation and eloquent phrasing deserve a bigger audience than simply brass enthusiasts." "Ã¬...he wore the limelight like a suit from Savile Row..a wonderfully elegant player, drawing from the bell of his horn a magic actÃ­s worth of tender phrases, raucous slides, leeping lines and stentorian bellows..."
"...extraordinary accuracy and rhythmic dexterity...His variety of sound, from drainpipe low drones to trumpetlike high notes, was remarkable." "The soloist - here the flawlessly playing American trombonist Joseph Alessi...great applause for Alessi"
"Joseph Alessi produces an uncommonly seductive sound at all dynamic levels and possesses well-nigh perfect intonation"
"Alessi was spellbinding in his display of tonal range and expressive parameters. The finale was all spectacular virtuosity on AlessiÃ­s part capped by a cadenza of breathtaking aplomb and flexibility. " 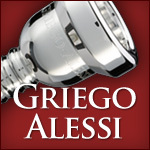 "Alessi played with consummate artistry." "The program opened with two works............ and the well-crafted Trombone Concerto from 1992 by James Pugh, essentially a pops orchestra piece that gave the PhilharmonicÃ­s excellent principal trombonist, Joseph Alessi an opportunity to shine." "Alessi, who plays principal trombone with the New York Philharmonic and who premiered the work with that orchestra, is the perfect candidate for Rouse\'s explosive style. With pinpoint intonation, snappy staccato tonguing and overwhelming power, he matched the orchestra phrase for phrase, decibel for decibel. He possesses a sweet, lyrical tone as well, beautifully exhibited in the elegiac quote from Leonard Bernstein\'s \"Kaddish\" Symphony in the finale." "If more trombonists made that instrument sound as Mr. Alessi does, perhaps we 'd have more music for trombone." "The Trombone Concerto by Nino Rota gave us the opportunity to appreciate the trombone in the virtuosi and lyrical facets so little exploited in the concert hall. The soloist demonstrated great technical agility, sense of ensemble and an impeccable homogeneity of the sound. His pedal tones were round and surprisingly pleasing and throughout the third movement his lip technique was dazzling..."
""Alessi's open horn work on "El Camino Real" is the very essence of virtuosity.....""
"Alessi showed himself to be an exceptional artist, joining together RouseÃ­s lines in such a way that phrases had direction and made musical sense. His skill at maintaining an attractive sound in all registers and his rhythmic steadiness were notable. And in the concertoÃ­s more elegiac sections, he achieved a degree of emotional expression that one would not think was possible with this instrument." "...ironclad tone, formidable technique, and huge dynamic range have to be heard to believe." "The concerto also profits tremendously from soloist Joseph Alessi's ardent championship, bold sound and easy virtuosity. Alessi, principal trombone since 1985 of the New York Philharmonic, boasts a timbre that has point as well as roundness. " ""Soloist Joseph Alessi handled the part splendidly...a fiercely dramatic player with reserves of emotional clarity......he turned the solo into a display of personal heroism, vaulting through Filas' arching melodies with ardor and imparting a darkly mournful hue to the more subdued passages."" "One of the highlights of the concert was undoubtedly the sheer brilliance displayed by the soloist, Joseph Alessi. His first half offering of Tovey's own composition, Urban Cabaret, inspired by images of the soloist stuck in traffic in Manhattan, entertaining the travellers, was truly fabulous and displayed stunning technical virtuosity as well as suberb control throughout the entire range of the instrument, before finishing on a super f#!. His performance of the Bluebells of Scotland in the second half was equally pryotechnic and his impromptu encore of one of the most fiendish trombone orchestral excerpts ever written, The Bolero, was a real treat for the listener. " "To balance the mellow trombone Ã³ played with a beautiful, burnished richness by Joseph Alessi, for whom the piece was written Ã³ the composer pitched her work dark: lots of viola, cello, bass and other trombones anchored the music......."
"The soloist in the work was the man for whom it was written: the Philharmonic's principal trombone, Joseph Alessi. He is a first rate instrumentalist, with a clear, elegant sound Ã³ rounded and unblaring Ã³ and gobs of technique. Also, he has a sense of how music should go (to put it most simply). It was a pleasure to hear him play Ms. Wagner's challenging concerto. I spoke of the possibilities of the trombone: Mr. Alessi shows them to us, in full. " "A substantial, well-crafted piece, it exploits the beauty of Mr. Alessi's sound as well as the trombone's high register"..."Mr. Alessi played his part with a liquid tone and consummate skill." "Joseph Alessi, principal trombonist of the New York Philharmonic, played with satin-finished tone and effortless virtuosity."